Hi Friends: There is a new challenge today over at the Stinkin' Inkers Challenges Blog, where the current theme is Guy Talk - any project for a special guy in your life. My creation for this week is birthday card using a favorite retired stamp from Stampin' Up, called Rev Up the Fun! It is a great stamp set making cards for the men who love racing, motorcycles, and cars. It's a bit hard to see in the photo, but I used some Glossy Accents on the car to make it shine. 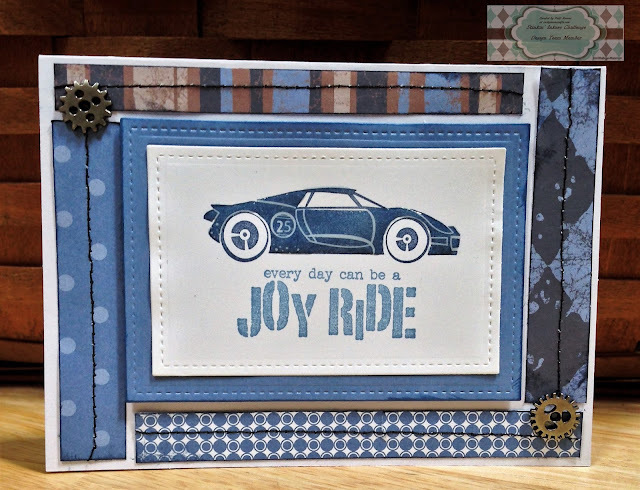 Stamp car image onto white cardstock with Night of Navy ink and sentiment with Brocade Blue ink. Cut focal image with stitched rectangle die. Cut next larger stitched rectangle die from Brocade Blue cardstock and ink edges with Brocade Blue ink, then mat begind the focal image. Cut strips of patterned papers to fit along the edges of the A2 card base, ink edges, and sew with sewing machine. Glue patterned papers to edges of card base. Use craft foam to add the focal image to the center of the card. Add Glossy Accents to car to create the shine and dimension. Finish with some small metal gears in the corners.